I'm afraid that the following post will mark me down as an old curmudgeon. But I defy any cute dog owner (meaning anyone who owns a cute dog, rather than a cute Dog-Owner) not to feel a modicum of frustration at being unable to walk down the street with one's pooch, without being stopped half a dozen times by everyone wanting to pet your pet. I get it, dogs are adorable, and my bouncy Yorkiepoo is especially friendly and fluffy. But when he practically dislocates my arm, pulling frantically on his lead because somebody three metres away is blowing kisses at him; or I'm trying to hand a parcel in at the Post Office, but can't get to the cashier because my dog is lying on the floor having its belly rubbed by a stranger, it's just a teensy bit irritating. It also makes it rather tricky to teach my pup good behaviour, when there are so many humans distracting him at every turn. When he's off the lead and running free, on the beach or in the woods, all bets are off, and anyone who can catch him is welcome to stroke, tickle, pamper and play with him as much as their heart desires. Perhaps it's my fault. Maybe I'm just not cut out to be a Cute Dog owner? Perhaps I should have got an English Bulldog (last year's winner of the Ugliest Dog Award) if I wasn't prepared to share my pup with all the strangers who fancy a casual canine cuddle. Or maybe I just shouldn't take him with me when I'm running errands and can't spare the time to have him cooed over. Alternatively, when asked the usual questions about his name and breed, I could just lie and warn people that his name is Killer and he's prone to random acts of aggression. 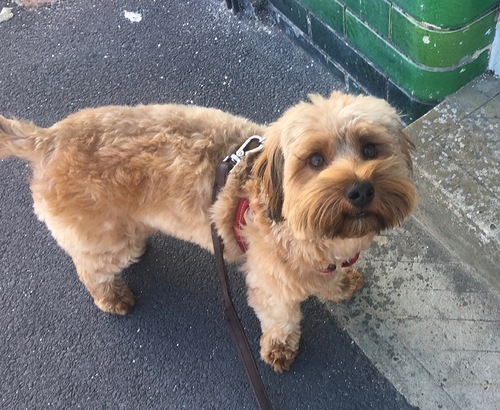 Looking at the docile ball of fluff that is Buddy would definitely confuse them, but it might at least add some amusement to the daily interjections….